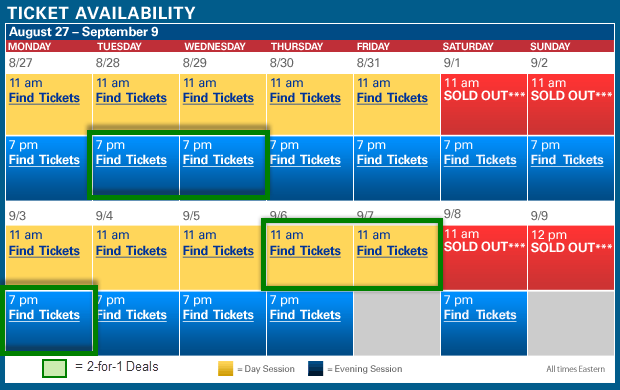 Are you excited yet for more US Open ticket promos? We are about 7 weeks away from the start of the US Open 2012! With many weekend sessions already sold-out at this year's US Open, Tennis-Bargains wants to help the most deserving tennis fans, kids and families who want to see it for the first time! We love hearing back from our fans! Hopefully our promo codes will help you enjoy the US Open while saving you some money this summer too. In the next couple weeks, we will be posting up a few more codes (until those tickets are all sold out). For those interested in catching pro matches here in the USA, the US Open Series is the way to go. They are starting this week in July with the first stop in California at Stanford University's (WTA Bank of the West Tournament) July 9-15. I had great memories of those tennis courts at Stanford with its terrific atmosphere and the excellent tennis weather. Hope everyone gets to enjoy at least one of the tournaments coming up, including the men's Atlanta Open July 14-22 (home of my Georgia Tech Yellow Jackets). The road trip continues every week at another new North American tennis location until we get to the US Open! Interested in winning some free US Open tickets? We want to share your top reasons for why you want to see the US Open this year, or your favorite US Open moment, or what experiencing live tennis means to you. We'll help make one lucky winner's dream a reality with free tickets. This could be the year that you're able to see possibly the greatest player(s) ever Federer, Nadal, Djokovic (or your favorite stars) in action together on the big stage. Or you maybe you really want to catch Kim Clijsters before her final farewell match at this year's 2012 US Open. How about being in the crowd chanting "USA! USA!" as another upcoming American like Brian Baker beats the odds and makes it deep into another grand slam. Every true Tennis Fan has a great story to tell - let's hear your personal favorite? Feel free to vote for your favorite comments and fan pictures with your "Likes". Looking for more discount codes, tickets for other sessions?